NAUGATUCK — Now that the students are gone, real work is getting done at Naugatuck High School. Workers contracted by Torrington-based O & G Industries have torn up the boys’ and girls’ locker rooms, the pool area and the parking lots in front of the main entrance and the gymnasium. They are laying synthetic turf on the football field and a new track around it. With barely anyone in the building until school starts in September, the $81 million renovation that will bring the school to mint condition by 2015 can inch closer to completion. As temperatures climbed toward 100 degrees last week, workers used heavy machinery to improve drainage under the parking lots. Summer is a perfect time to complete aspects of the renovation that would be too noisy or disruptive during the school year, said Joe Vetro, project manager. The storm sewers are being improved to comply with new regulations that prevent runoff from being dumped all at once into Long Meadow Brook nearby, Vetro said. Parking in front of the main entrance is nonexistent now, but by the time school starts again, a binder course will be laid and a parent drop-off loop will be added. The parking lot in front of the pool will also be available again, Vetro said. “They will have more parking in the fall than they had in the spring,” Vetro said. Football players occasionally drop by to watch the synthetic turf being laid. Numbers and tick marks are still being painted, Vetro said. A rubber and sand mixture will be spread underneath to give the turf its squishy feel, and a binder course is being put down for the new track. While the football players watch the changes with excitement, swimmers might be a bit more depressed to see the pool empty and drained. A stair tower has been removed near the pool and the exterior framework for a natatorium is going up. 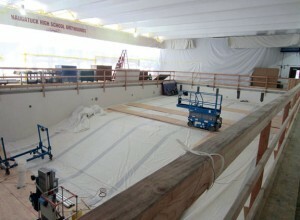 The pool area will be finished by January at the latest, with new acoustical panels, lights and sprinklers, Vetro said. A new boys’ locker room is being built, while the old one is being abandoned for storage space, and the girls’ locker room is being improved, Vetro said. The floor in the auxiliary gym has been refinished and new duct work and fixtures are being installed, Vetro said. Students should be able to use that gym by the end of September. Asbestos abatement is taking place in the Goodyear wing of the building, in addition to portions of the Castle and Judd wings. That must be done by the end of the summer. Renovations in the Goodyear wing will continue into the school year, Vetro said. Displaced classes will be held in temporary space in the media center and in former shop classes. The Goodyear classrooms should be finished by January. Walls will continue to go up in the patio area in front of the school, which will eventually be filled in with offices, Vetro said. That area will not be finished until next summer. The state legislature last month approved a 74.6 percent reimbursement rate for the school renovation project. “That was a slight bit higher than what we had anticipated,” said Robert Butler, controller and school business manager. In one of his last acts, former Controller Wayne McAllister bonded $26 million last month for the project’s operating costs, Butler said. The remaining amount will be bonded at the end of the project, after all costs are incurred and state reimbursement is received, Butler said. Exactly how much the borough ends up paying will depend on whether unforeseen changes affect the project, Butler said. Nothing has gone significantly wrong so far, Vetro said.